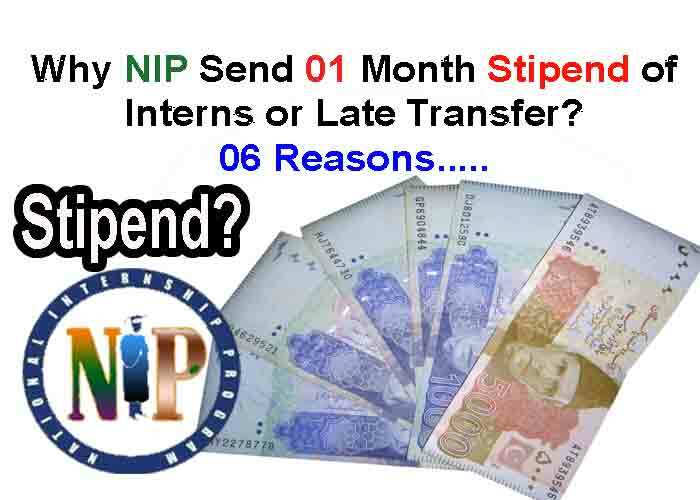 Assalam o Alaikum to all I hope all of you will be good, in this post I Just tell you about Stipend of Interns from NIP. Many of NIP interns say about why transferred one month of stipend to their accounts because they have 3 months of pending stipend. but why NIP send just 1-month stipend. you are on right at this time, but it's behind maybe you are absolutely wrong. you know mistake on both sides from you and NIP. NIP tell you some dates of stipend disbursement, but that dates were passed, so it does not mean that NIP says wrongly. Because sometimes, some problem is not completed on given time due to some legal issues, So suddenly, there is a possibility that can not be resolved on time. The second mistake from Interns of NIP. Interns also make mistakes.many of candidates of pmyts doing wrong, and then they grip by monitoring teams they said, they on the right path. There are many mistakes that cause your stipend stopped by NIP or late transferred. Some of them mentioned Below. Wrong Feedback or Using Bad Language. Irrelevant Questions on Support center of Their web portal. First of all your stipend based on the monthly assessment report of your whole month record provided by your respected Employer/Furcal Person via the online monitoring NIP web portal. and the major reasons for salary/ Stipend is your assessment. If your assessment updated on time or you submit an assessment report on given time you will be able for the stipend, and another vise you don't get any stipend by NIP. So for stipend please update your assessment history or report before the last date of monthly assessment uploading. 2. Out of Date Submission. The 2nd reason of salary/stipend stopped or late transfer from NIP or NBP to their accounts is out of date submission of assessment or submitting late assessment/attendance report to their respected person like a focal person or employer-provided by NIP for your management. If you submit your progress or attendance report too much late to employer/ organization then the result is you do not get this month stipend because of late or out of date submission. The 3rd reasons are low assessment below than 3.0 score. someone interns ask me what is meant by 3.0 score? this means that if your assessment score is below than 3.0 you are not eligible for a stipend because your performance report is not good or working progress is so a week or not come to your working area like as a company/organization and office. So increase working performance of high score above 3.0. 4. Wrong Feedback or Using Bad Language. Nowadays a major fact of late stipend or stopped. is the bad language of Interns. some of the interns using bad language and abusing on the scheme and he/she behave is so rudely on scheme, employer and all staff of NIP. Many of candidates used feedback, but in feedback, they wrote to hard words, abusing bad behavior. 5. Irrelevant Questions on Support Center of Web Portal. In first web portal issue, you can just ask about the portal, why portal sometimes not do not work or password/ username issue or web portal menu issue etc. In second stipend issue this option just uses for a stipend, but some interns using this option for another work for example in my knowledge an intern of NIP asking about his friend relocation by using own web portal on this options so it's totally a wrong way. In fourth and last is about relocations issue, relocations mean transfer from one place to another place. Interns just one time relocate from current to any other place before given date after joining first time to any place. If the attendance sheet/letter wrong or fake then your focal person could not update your assessment. Employer/Focal person have authority against these type of Interns to report NIP or monitoring team. NIP or PMYTS scheme will be terminate that candidates or Interns from the scheme. They will no longer to continue there training or can not get the stipend from NIP. Above mentioned reason if resolved by every interns NIP will solve your problems and also send you monthly stipend on date, every candidate of pmyts make your self be regular/punctual and active on their working place for better result and good performance for his/her experience and respected organization.After completion of one year Internship you can work with many companies/organization or any private or govt sector based on this internship experience. In last I hope you will like this topic if someone has any suggestions or problem please tell us by using below comments box. and don not forget to subscribe our Youtube channel for latest info. visit link Al Akbar Center Youtube for subscription and get notification on directly your mailbox quickly. you can also visit our other website for further details about NIP schemes or any anther info related to your qualifications or latest jobs. if you want latest jobs search in google as Bilalakbar.com jobs or visit link http://www.bilalakbar.com/search/label/Jobs.in this search jobs which are meet to your qualifications criteria and apply before the last date. May be you satisfy about Stipend of previous month issue, NIP will send your remaining stipend in this month or in the last month of Internship. Watch video for further details and subscribe must.